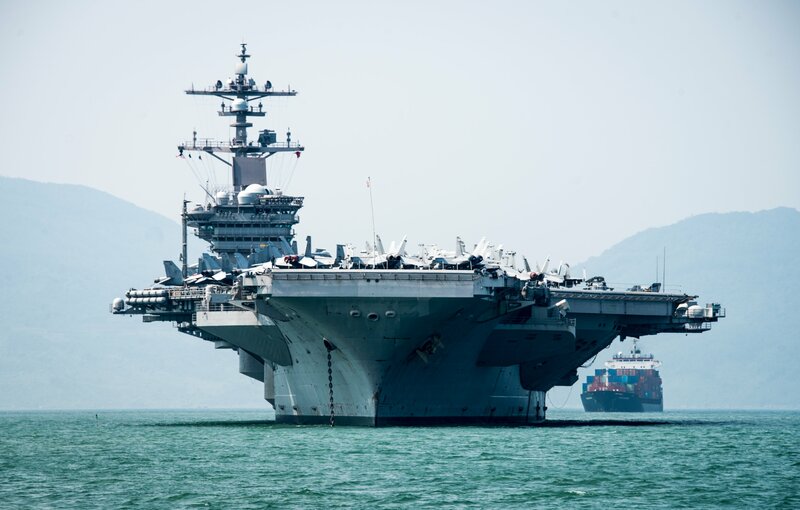 Aircraft carrier USS Carl Vinson (CVN-70)’s historic port visit in Da Nang, Vietnam, this week is meant to continue building trust and goodwill that could deepen the navy-to-navy relationship between the two former enemies. The carrier, along with cruiser USS Lake Champlain (CG-57) and destroyer USS Wayne E. Meyer (DDG-108), arrived in the central Vietnam port city on March 5 with an itinerary that included sailor-to-sailor engagements, community service projects, sports and music activities and more. Though U.S. Navy ships have made port calls in Vietnam since 2004, this is the first time a U.S. aircraft carrier has come to Vietnam since the end of the war more than 40 years ago. Rear Adm. John Fuller, the Vinson Carrier Strike Group commander, told reporters in a media teleconference late Monday night (Tuesday morning local time) that Vietnamese sailors were also welcomed aboard Vinsonto learn how the crew approaches firefighting, flight operations and other aspects of carrier operations. “They’ve gone around and had a chance to engage with our sailors and just get a feel for the personality of our sailors,” Fuller added. “We committed (to scheduling a carrier port visit), and we made that commitment, and that in itself is important because it helps foster the trust that we want to foster within our partnership,” he added. Senior leadership from Vietnam greet leaders from U.S. 7th Fleet, the U.S. Embassy in Hanoi, and the Carl Vinson Strike Group — including 7th Fleet commander Vice Adm. Phillip Sawyer, center — during a welcome ceremony in Da Nang, Vietnam, on March 5, 2018. US Navy photo. Sawyer also noted that the person-to-person relationship-building allowed by a visit like this is important. For example, he said, the head of the Da Nang People’s Committee sent a condolence letter after last year’s USS John S. McCain (DDG-56) fatal collision, and Sawyer said this week he’s been able to thank the committee in person for their letter. 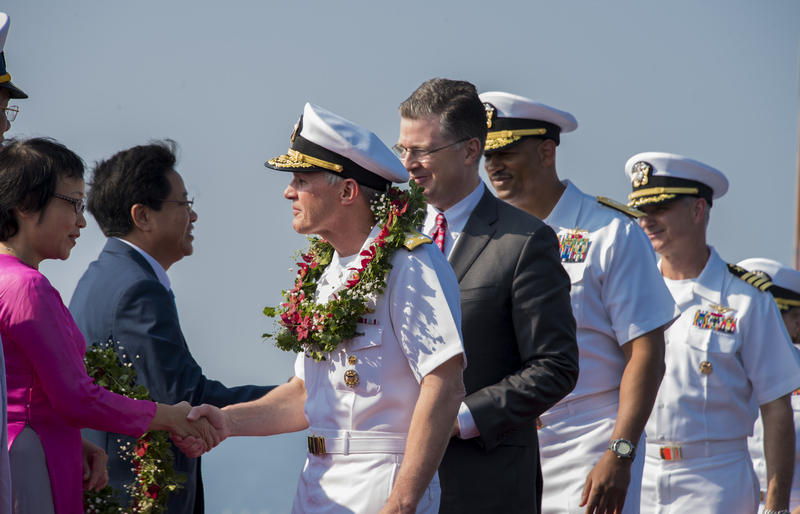 The Navy and U.S. State Department have billed this visit as symbolic of the deepening ties between the two countries and as a builder of goodwill that could open future opportunities – though Sawyer was coy about what the future of U.S.-Vietnamese naval activities could look like. “I will work closely with my Vietnamese partners, and we will develop ideas and options for what makes sense for both of us,” he said in response to a question. Senior leadership from Vietnam and from U.S. 7th Fleet, the U.S. Embassy in Hanoi and the Carl Vinson Carrier Strike Group, pose for a photo during a March 5 welcome ceremony in Da Nang, Vietnam, for the aircraft carrier USS Carl Vinson (CVN 70) as part of its port call. US Navy photo. Looming in the background of the visit is China. Within about 200 miles of Da Nang sit both China’s Hainan island and the Paracel Islands in the South China Sea that are claimed by Vietnam but controlled by China. Sawyer made clear that “it’s about Vietnam” and not China when it comes to the message the visit sends – that the event “continues a path we’ve been on that continues to build a robust partnership” between the two navies. “Conflict is not inevitable, but security doesn’t happen by itself either. And that’s why we, the United States Navy and the 7th Fleet in particular have been out here for 75 years … and we are going to be out here for the future,” Sawyer concluded.